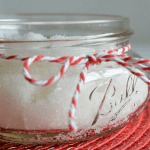 Add melted coconut oil to the sugar, as well as the peppermint oil. Stir well to combine, then place inside an air-tight container. For gift giving, use a small Mason jar and some holiday-themed twine along with a gift tag.